Some brands that have both gas-powered and hybrid versions of certain vehicles redesign the models one at a time, typically starting with the gas model before then updating the hybrid model the next model year. That’s not the case for the 2019 Toyota RAV4 Hybrid in Moline IL, which entered the model’s fifth generation alongside its conventional counterpart. We couldn’t be more pleased with the radically reimagined RAV4 & RAV4 Hybrid and are happy to be able to offer both models in our inventory right now. 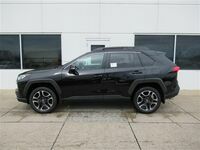 First introduced back in 1994, the RAV4 has undergone plenty of redesigns and different body styles before ending up with the incredible design that the all-new 2019 models have adopted. This year marks the beginning of a new RAV4 era and we cannot wait to see them cruising the streets of the Quad Cities. 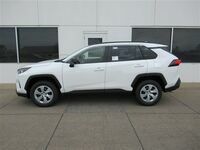 Most of what’s available in the RAV4 Hybrid is the same as what the conventional RAV4 offers, with some differences. Naturally the biggest difference is going to be the inclusion of the hybrid powertrain, which effects performance and efficiency more than anything. The hybrid system underpinning the RAV4 Hybrid combines a 2.5L 4-cylinder engine with a multi-electric motor and a 244.8V Nickel-Metal Hydride battery. The combination provides a combined horsepower of 219, which is pretty impressive for a hybrid crossover, while achieving an astounding 41 miles per gallon city and 38 mpg highway fuel efficiency. As mentioned, however, there are a ton of great features and technologies found throughout the RAV4 Hybrid that it shares with the regular RAV4. For instance, Toyota Safety Sense 2.0 provides a host of great driver-assistive safety features like Road Sign Assist and Lane Tracing Assist while things like the hands-free power liftgate and heated seats both in the front and rear enhance aspects like convenience and comfort. 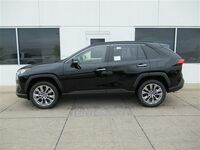 If you’re interested in a 2019 Toyota RAV4 Hybrid of your own, be sure to get in touch with us right here at Hiland Toyota.